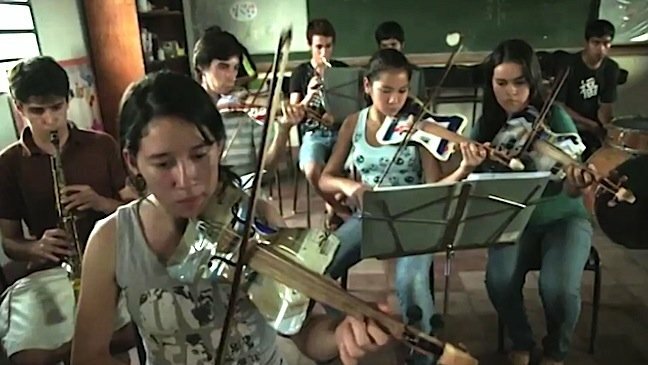 Home Tags Posts tagged with "recycled materials"
An orchestra of young musicians from a Paraguayan slum has been touring South America, using instruments constructed entirely from recycled materials. They pulled them from the rubbish dump around their homes. Landfill Harmonic is heartwarming film featuring a unique orchestra in Paraguay made up entirely of instruments made from scrap heap rubbish. The Recycled Orchestra is the creation of Favio Chávez, a landfill worker and musician from Paraguay. The film, a teaser for which has been published online, features Favio Chávez and an inspiring group of children beating the odds in the poverty stricken town of Cateura. But despite the critical levels of pollution and the threat to their health residents of Cateura manage to find the most positive of uses for the rubbish. Inspired to do something to help the impoverished families, Favio Chávez began using the trash in the landfill to create instruments for the children. “One day it occurred to me to teach music to the children of the recyclers and use my personal instruments,” explains 36 year-old Favio Chávez, who worked as an ecological technician at the landfill. The documentary is directed by Graham Townsley. The instruments in the orchestra are made from a whole range of old and broken electrical appliances. By using them whole or in part they have been put back together to create new musical instruments that have a unique sound.